This year the United Families marked the 20th year of the annual rally and protest by also holding a conference on 26 October, followed by the rally on 27 October from Trafalgar Square to 10 Downing Street. The conference entitled Interrogating State Violence: Custodial Deaths, Justice and Resistance, was a co-production by the Centre for Research on Race and Law, United Families & Friends Campaign, Migrant Media and 4WardEverUK. Over 250 people attended the conference held at The Light, Friends House in Euston London. It was opened by Akala (BAFTA and MOBO award-winning hip-hop artist, writer and social entrepreneur, Supporter of UFFC), with a powerful statement on social justice and progression which earned him a standing ovation. Other keynote speakers included Janet Alder, the sister of Christopher Alder who died in Hull Police Station in 1998 and who has campaigned for justice ever since, and Sherene Razack, distinguished Canadian Professor and the Penney Kanner Endowed Chair in Women’s Studies. A number of other presentations were delivered by family campaigns, support organisations and scholars including Saqib Deshmukh (Justice for Paps Ullah Campaign), Deborah Coles (INQUEST), Marcia Rigg and Aji Lewis (Justice for Sean Rigg Campaign and Justice for Seni Lewis Campaign), Tippa Naphtali (Mikey Powell Campaign / 4WardEverUK), Dinesh Napal (Graduate in Law, Development and Globalisation) and many others. The conference also included a screening of INJUSTICE (by Migrant Media/Ken Fero & Tariq Mehmood) which highlights the struggles for justice by the families of people that have died in police custody (Winner Best Documentary BFM London Film Festival 2002, Winner National Social Justice Award 2003, Winner Best Documentary (Human Rights) One World Film Festival 2003. Distributed by the BFI). 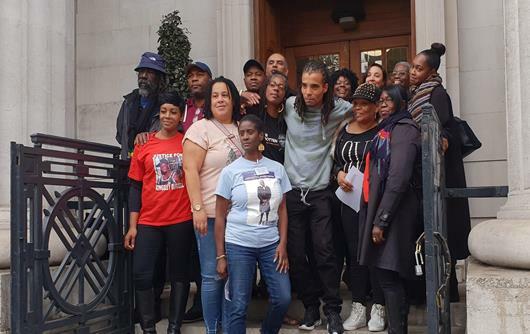 This years event was attended by about 400 people including the family campaigns of Kingsley Burrell, Leon Patterson, Kishni Mahay, Marc Cole, Sheku Beyoh and many others, as well as groups such as INQUEST, Fight Police Brutality, Black Lives Matter, London Against Police Violence and others. Families addressed the crowd giving their accounts of what happened to their loved ones and their long and continuing fights for justice and accountability. See images from the conference and rally via 4WardEver on Flickr and Outside The Whale Pics.